In the field of ‘self-help’ and ‘personal growth’ there are literally thousands of books one can read, hundreds of workshops one can attend. Although many may be quite good, there is also such a thing as TMI, Too Much Information. Some of the information can be contradictory; some may be misleading, some might be devoid of any substantial evidence, but sounds good. 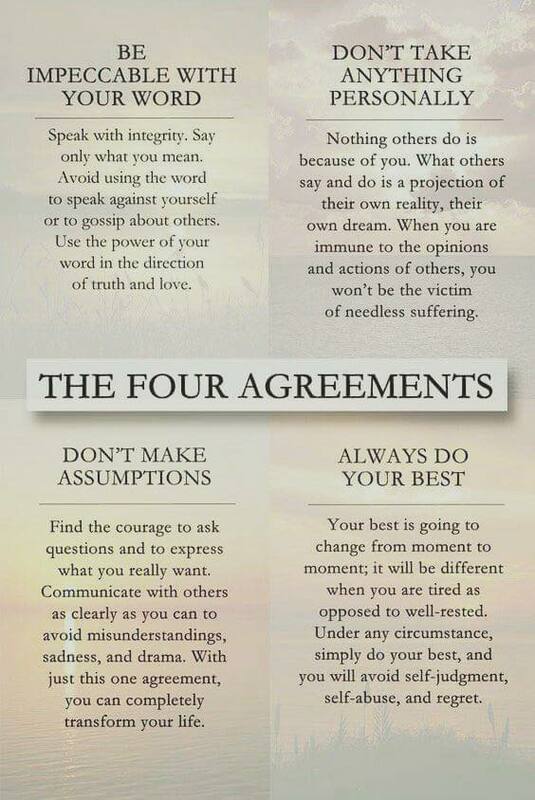 I rarely recommend books, but there are a few worth noting, one of which is The 4 Agreements, by Miguel Ruiz. Like many of the more useful tomes in this field, The 4 Agreements is not something made up by the author but, rather, is drawn from an established set of understandings going back thousands of years. If you are interested in reading a worthwhile book described as ‘a practical guide to personal freedom,’ consider The 4 Agreements by Don Miguel Ruiz.